The middle school program is designed for students in 6th, 7th, and 8th grades. We meet in the middle school room during Sunday School time and help with younger student devotionals. For service to the church and fund-raising, middle schoolers participate in the wider youth projects with acolytes and Sunday School, such as baking day, wreath-making for the tree lighting, and the Haiti project. As a Sunday School class, we have a weekend retreat at the Incarnation Center in the spring. Middle and high school students are able to participate in Connecticut diocesan opportunities: The Night Watch at St. John the Divine and the VBS week in the Dominican Republic. We are lucky to have a great group of acolytes here at Christ Episcopal Church. In our 6th year, we have maintained an average active roster of 19-20, plus six senior acolytes who serve when needed. New in the fall of 2016 were Emily A., Emily C., and Avery. 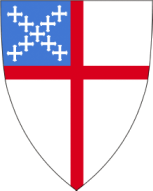 Welcome, all of you, to the Christ Episcopal Church acolyte program. They join Natalia, Carter, Keelyn, Mariam, A.J., Zoe, Lilah, Alex, Megan, Kenneth, Gabriela, Natalia, Sofia, Luke, Olivia, and Lauren. Serving when needed are Kayla, Andre, Zoe, James, and Mark. A special thank you goes to Andre, who acted in my behalf at the Christmas Eve 10 p.m. service,getting the acolytes through lighting numerous candles and the changes to their normal routine. Three acolytes are required each week, holidays, and special services. Each acolyte is scheduled to serve about every 4-5 weeks. On Palm Sunday, Easter Sunday, and at Christmas, all acolytes who wish to serve may do so. Your youngster can be an acolyte; you just have to be in at least 4thgrade to be a torch bearer, and to be a crucifer you have to serve for at least six months as a torch bearer and be in the 6th grade or higher. Training is ongoing, and you can contact our Parish Administrator or Fr. Harrison and myself following the 10 a.m. service. We would like to thank the acolytes’ parents who get their youngsters to church each Sunday. I am grateful toSuky, Melissa, Lisa, Donna, John, and Holley for overseeing the acolytes on Sunday mornings in my absence. Thank you, Annie Rae, for stepping in to serve as crucifer when our acolytes are on vacation. Planning for the acolytes’ trip to the National Cathedral in Washington, DC, for the “Annual Festival of Acolytes”will start shortly. Fr. Harrison, members of the parish, and I much appreciate all your efforts as acolytes in our services.